Almost fades out, the scene – a home? – suspended. 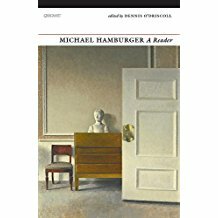 A Michael Hamburger Reader is a tribute to the great Anglo-German writer. It was edited by Dennis O’Driscoll, Hamburger’s friend, a poet and essayist himself. In this 600-page collection, O’Driscoll manages to get the reader as close to Hamburger as possible in one book. It feels very much like spending a week at your grandfather’s house – getting to listen to all his stories, roaming through cupboards, reading the works hidden inside. We spent less than a year in Edinburgh; and even though I roamed many different parts of the city with that gang […], the city of which we had the freedom was still not that of adults, but a playground and battlefield. When I saw Edinburgh again as an adult I recognized nothing but the obvious sights and a tea-shop or two in Princes Street. The single cry that proved his numbers wrong. Thank you for a beautiful post about this wonderful book!